Individuals were solicited to participate in a public gift exchange that would generate an American version of Price-Tag Gift Wrap. Participants were asked to purchase items bearing legible (and removable) price tags that could be offered as gifts. (They were told that the items should serve as things people would enjoy receiving as presents.) Each participant brought his or her gift item to the gallery by a particular date where its price tag was carefully removed and re-applied in a random pattern on a single sheet of paper. Once the sheets were printed, they were used to wrap all the gift items brought to the gallery which were then displayed on shelves to comprise a work in the exhibition. 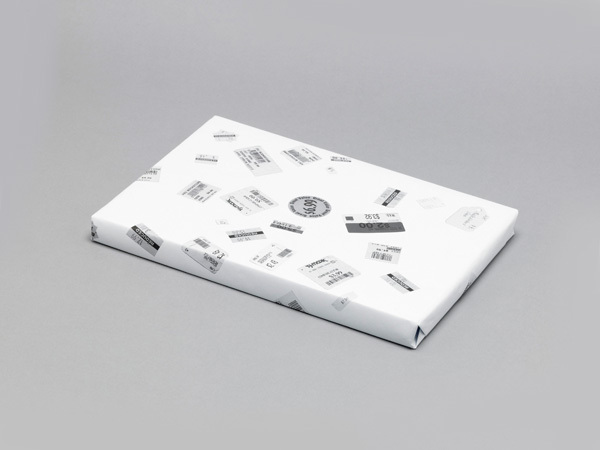 Every gift brought to the gallery is represented on the paper by its corresponding price tag. At the end of the show each person who gave a gift returned to the gallery to select a gift (on a first come first-served basis). Eatock wonders if participants will open the gift to discover the item inside (ostensibly compromising the work), or keep the artwork intact and conceal the gift?